A beautiful Saturday morning to you, dear readers. 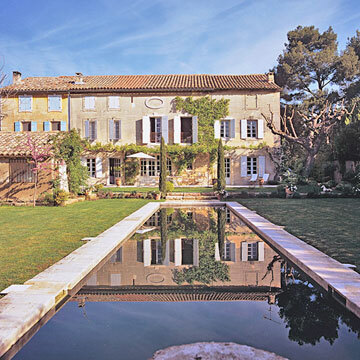 Today I'd like to show you this majestic house in Provence. It is the result of the merging of three 1850s buildings. Two deteriorated houses with a run-down barn in between were renovated and joined to create an impressive house with modern comfort and old-world charm. Old beams and stonework were preserved, and the new stonework mimics the original. A truly splendid house for us to tour this Saturday. A wisteria-shaded pergola by the stone-edged reflecting pool. Blocks made of local limestone create a dining terrace at the front of the house. Double living rooms bring an open floor plan to the main level of the home. 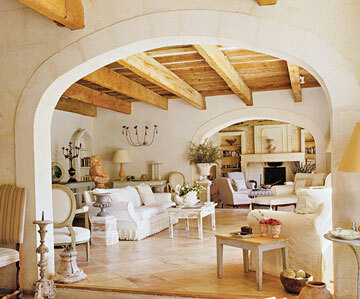 These two rooms--one large, one small--are linked by newly constructed arches. 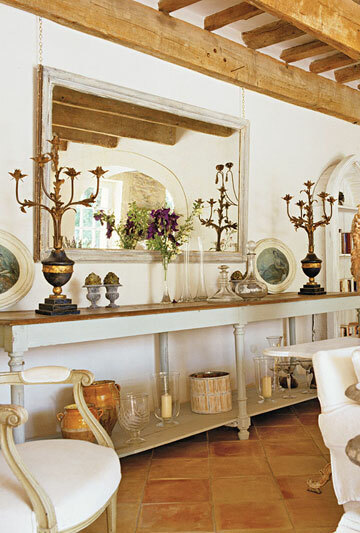 A fruitwood-topped buffet running along the rear wall of the large living room provides display space for the homeowner's antiques. Tucked under a stairway, a seating area in the small salon provides a cozy retreat near the room's limestone fireplace. The house's original structural beams are displayed in the small salon, characterized by the extraordinary patina of generations of paint. The flaking and peeling layers were lightly sanded to reveal a mosaic of subtle colour. The kitchen is a simple area arranged as a combined cooking and eating space. 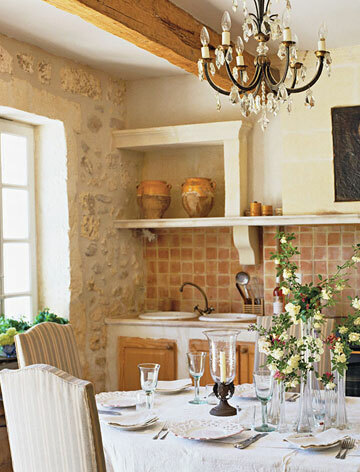 The old stone, wooden cupboard fronts, and limewash blend subtly with the rest of the main-level rooms to enhance the feeling of a united living space. 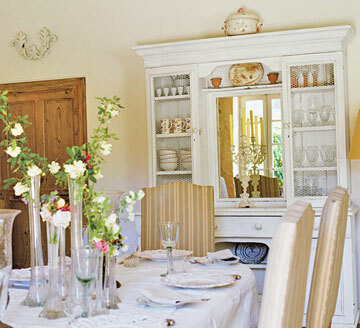 Upholstered chairs and antique linens in the dining room. 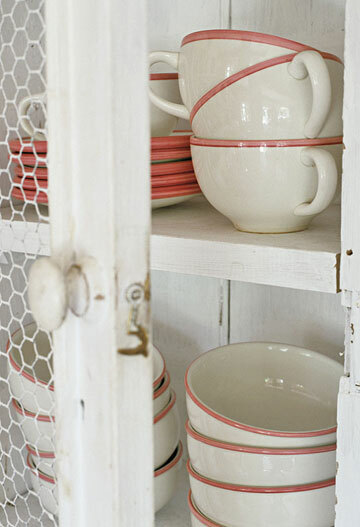 Dishes are stored in this antique hutch with chicken wire on the doors. 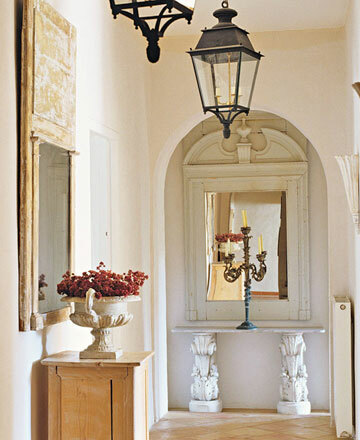 An antique Italian mirror at the top of the stairs makes a strong statement. A neutral palette, combining cream linen and cotton in this bedroom, which was part of the former barn Muslin drapes over a romantic four-poster. 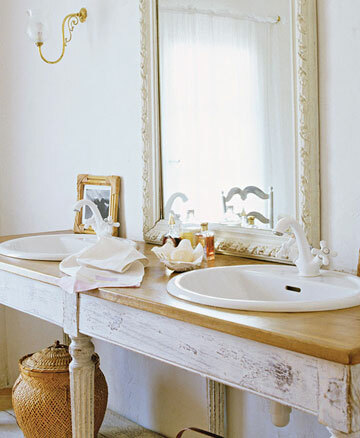 A pair of porcelain basins were mounted into a country table to create a rustic vanity unit in this bathroom. 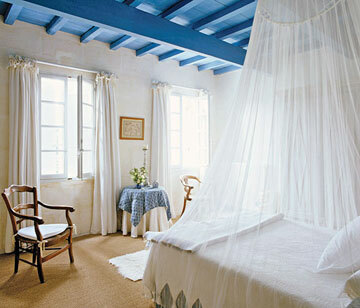 The intense blue painted on the ceiling beams of this bedroom adds a bold splash of color. Four-paned windows admit plenty of light into the space. 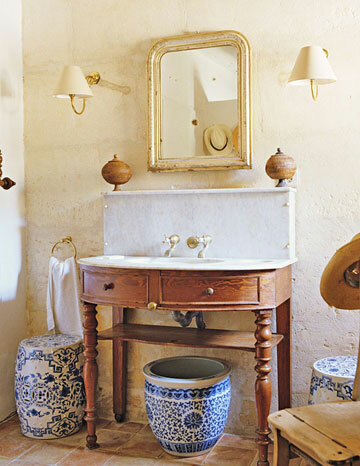 Chinese porcelain pieces in the second bathroom continue the blue-and-white theme with its accompanying bedroom. All images and information from Remodeling Center. No quiero pensar en el trabajo que debe ser restaurar una de estas casas hasta dejarlas así... a mí me cuesta mantener las hojas fuera de la casa, jajaja. Imaginate el ejército de gente que habrá trabajado ahí. Así cualquiera! Wow I love the porcelain pots in the last pic! what an amazing space! loving it!! Wow, What a gorgeous home...love the beams and stone walls. Absolutely beautiful! Wonderful! I have an 1820-1840 farm house and I assure you it looks NOTHING like that. This is why all those "expat in Tuscany, Provence, etc" books sell so well. I mean, seriously, how could you be anything other than relaxed and at peace in a place like this?